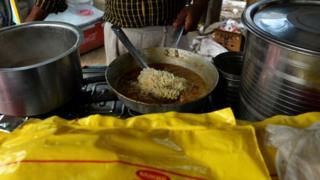 India has ordered tests on Maggi noodles after some were found to contain high levels of lead. They have been temporarily banned from sale in Delhi and some grocery chains have taken them off their shelves. Nestle India denies its products are unsafe. Food writer Sourish Bhattacharyya explains India's enduring relationship with its favourite noodles. When Maggi instant noodles arrived in India in 1983 - the year when India lifted the cricket World Cup for the first time - they instantly caught the nation's imagination. The idea that anything could be cooked in two minutes had an immediate impact on a people that had invented slow food centuries before it became fashionable in fast food cultures. The "two-minute noodles" advertising campaign on state-run television with which Maggi launched itself turned out to be an instant attraction because of its liberating message for women. The "Maggi Mom" was not only seen as loving and caring of her children as her mother was of her, but she was also able to juggle her workplace and domestic responsibilities because of the snack. Coming from Nestle, it had to be trusted, despite the foreignness of a product that India had not seen before. The Maggi promotional campaign, moreover, was among the first to recognise the changing profile of middle-class women in metropolitan India. Nestle has had a long relationship with India that goes back to 1912, when it launched in the country as The Nestle Anglo-Swiss Condensed Milk Company (Export). Milkmaid, a sweetened condensed milk, was the brand that the company soon became synonymous with. Its 400g can hasn't changed over the century, although the packaging has become slicker. After India's Independence - 1947, incidentally, was the year when Nestle acquired Maggi - the company was quick to recognise the new government's emphasis on local production and formed its Indian subsidiary in 1961, setting up its first factory at Moga in Punjab state. The choice of the location was also government-dictated because the then dispensation, steered by the socialist idealism of India's first PM Jawaharlal Nehru, wanted Nestle to develop the milk economy of Punjab. Maggi travelled across India on the back of this formidable legacy and soon it was everywhere. Within its first 25 years, it was able to command 90% of the quick noodles market it had created. Unsurprisingly, when the brand launched the Me and Meri Maggi campaign (Me and My Maggi campaign) in its silver jubilee year in 2008, inviting people to send in their personal Maggi stories, its advertising agency Publicis Capital was deluged with more than 30,000 entries. It was a testimony to the deep inroads Maggi had made into the everyday lives of its loyal customers. India today is the biggest market for Maggi noodles in the world, despite the serious challenge mounted on the brand by rival Top Ramen in the 1990s. And Maggi, along with the buffet of complementary products - soup mixes, sauces and cup noodles - contributes more than 20% of Nestle India's revenue, clocking around 15bn rupees ($235m; £149m) in annual sales. Just last year, a leading survey re-affirmed what everybody knew already: Maggi was the country's most trusted food brand. The BusinessWeek magazine commented with considerable insight in 2006: "Maggi has managed to enter Indian homes to change the traditional food habits of Indian children on its promise of convenience. This brand has understood the psychology of Indian mothers and positioned itself for mother-child indulgence." Priced at 12 rupees (18 cents; 12 pence) a serving, and with three generations of Indians growing up with it, Maggi was able to transcend all age and economic divides. It spawned legions of Maggi "entrepreneurs" who have been selling instant noodles to office-goers and college students with nothing more than a pressure stove, cheap aluminium utensils, and stainless steel crockery and cutlery at their command. Popular hangouts such as Jaipur's Tapri restaurant, which began as a "Maggi joint" started by two MBA graduates, serve Maggi in a dozen innovative ways. A lot goes on over a piping hot bowl of Maggi. Farzi Cafe, restaurateur Zorawar Kalra's hugely successful venture at India's first "food mall", in Delhi's suburb of Gurgaon, used to serve Maggi with foie gras. India banned the import of foie gras last year following protests by animal rights activists that the method used to produce the French delicacy by force-feeding ducks and geese, was cruel. "I must say I fell in love with it - before the government banned foie gras. It's ironic that the other half of this delectable dish, Maggi, is also heading towards a nationwide ban," Zorawar Kalra says. Moments before the 15-day ban on the noodles came into effect in Delhi on Wednesday, a popular business news channel anchor plastered Facebook with pictures of her and her colleagues wolfing down their "last bowl of Maggi". There was a sense of loss and longing in her post, and it encapsulated the feelings of most Indians who have grown up with Maggi. For years, many Indians have considered Maggi to be junk food and most schools in Delhi do not stock the snack in their canteens. Parents who give Maggi products to children in their lunchboxes have been sent polite notes advising them against doing so. But as the sales show, millions of Indians buy and consume Maggi daily and a quick search on Google shows lots of different ways, including some rather strange ones, in which people cook and consume the snack. Well known food writer Tarla Dalal offers recipes to make samosa patties stuffed with cooked Maggi, cheese and vegetables; deep fried Maggi-cheese-vegetable fritters; and adding cooked noodles with cheese and herbs to make open toast sandwiches. There are also recipes for making Maggi-omelettes and vegetable soups with Maggi. But the snack achieved cult status in India mainly because of the ease of cooking it - Maggi's "two-minute" advertising campaign suggested just opening the pack and adding the noodles and seasoning to boiling hot water and cooking it for just two minutes. And that is just how most Indians like to eat what are often described as "India's favourite noodles".